Superheroes – Draw some traits at random. Some are crazy and stupid (IE, transform into a slime) and save the day. A brainstorming game (how meta!) – Draw a card from a pile. You have 1 minute to come up with as many ideas as possible. The card drawer decides the best one. First to 5 or 10 wins. Road-Trip game – you have a ‘bomb’ of a car; try to beat your friends to the end of the board without your car falling apart. Zap! – Similar to Pieface; Mimics plugging a fork into a powerpoint, Russian-Roulette style. Obviously significantly lower voltage. “How much can you get away with in a library before being kicked out” – board game edition – Try and wreak as much havoc as possible in a library as the librarian is trying to catch you and kick you out. 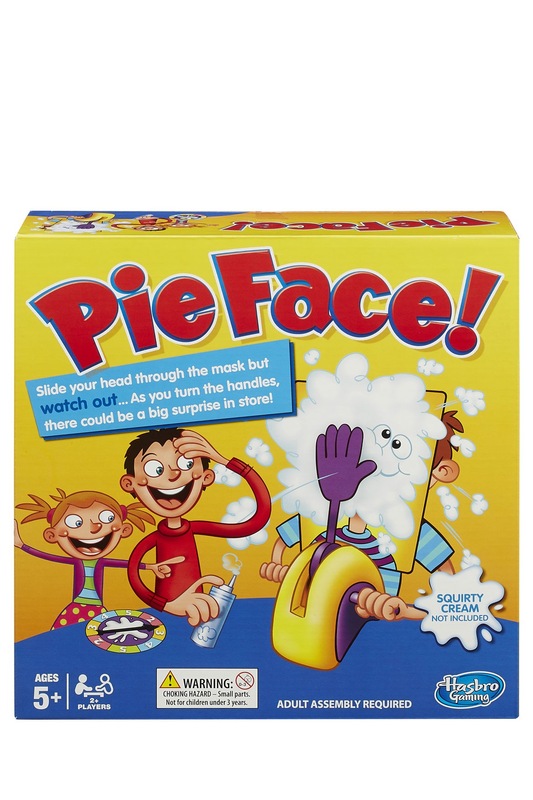 Pie Face – a game where players take turns spinning the wheel to determine how many clicks they get, russian-roulette style, to see who gets whipped cream flung at their faces. I came up with a few good ideas here. For example, our teacher seemed intrigued by the superhero game at #4. I think #1 would be fun to make, however I don’t think it’ll be physically possible to do so within the time constraints of the semester. #6 Brainstorming game also seems fun to do, and could possibly be a fall-back simple type game if the game I really want to make falls through. Which brings me to my final idea, which technically could have been #10 on the list, but I chose to leave it out as I’d been thinking about it since the beginning of the semester. I love D&D, but I never have the time to play it. Character generation takes a while and when you’re new to the game, learning all the rules can be quite intimidating. Thinking about this led me down a thought-train that included the words, “what if I made a version of D&D that was a very light version with everything pre-prepared and ready to go for people who are new to the game concept?” (that’s a lot of words. I tend to overthink). I think this is my favourite idea so far, and I will be doing my best to work it into an actual game from this concept that I can playtest over video and distance, so that my long-distance friends can also take part.